Get ready for the scent of patchouli, hemp and incense to come wafting through southeastern Wisconsin this weekend as jam-band fans from around the Midwest make their way into the area this Saturday and Sunday for two Alpine Valley Music Theater shows featuring the rock band Phish. 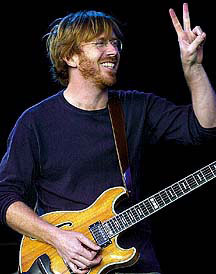 Led by frontman Trey Anastasio (vocals/guitar), and rounded out by co- founding members Mike Gordon (bass/vocals), Jon Fishman (drums/vocals) and Page McConnell (keys/vocals), Phish have proved through their sprawling and experimental musical improvisations, extended jamming, genre cross-breeding and years of incessant touring, that they are, without question, the heir apparent to the jam-band throne once owned by The Grateful Dead before they disbanded in 1995 after the death of leader and guitarist Jerry Garcia. While Walworth County may welcome, or at least put up with, Phish and their fans to the area this weekend (this will mark the eleventh time they've visited Alpine Valley since '96), the city fathers and some residing residents have not always greeted this type of infultration of latter-day hippies with open arms. In the '80s The Grateful Dead were always a perenial mainstay at Alpine Valley (performing here 20 times from 1980 through 1989, and even stating that it was one of their favorite venues to play). But after a third show on July 7th, 1989 the group was permanently banned from the facility due to overcrowding and unruly & obnoxious fan behavior throughout the several years of playing at the venue. In August 2002, the remaining members of The Grateful Dead reunited as The Other Ones and would once again grace the grassy hill of Alpine Valley - but not before stategic plans, proposals and negotiiations with city and country officials were approved and the ban was lifted. While these two sold-out shows were heavily staffed with round-the- clock security, they went relatively smooth [or should I say, "really mellow, man," judging from the tens of thousands of hippies setting up camp and partying like it was 1969 all over again in the venue's expansive parking lot]. Since The Grateful Dead's demise Phish has not only picked up virtually all of their fans, but also a new younger fanbase interested in the jam-band culture. And while Phish has only played here once since their 2004 breakup (that was last June when the band reunited for a summer tour), it seems that both fans and the non-hippy loving locals have learned to adapt to one another - as if an in-law had dropped-in all of a sudden for a two-day stay. The same can be said - perhaps to a lesser degree, however - when other jam-band friendly acts such as The Dave Matthews Band and The Black Crowes perform here as well (the latter who filmed their "Hard To Handle" video at Alpine). Issues aside, the one thing that fans will certainly get is their money's worth of quality music. With Phish's renowned lenghty sets, along with a massive back-catalog of their own music that dips into rock, jazz, psychedelia, funk, folk, prog rock, bluegrass, reggae, country, blues, avant garde and even classical, it's anyone's guess as to what excatly they'll be pulling from their hat. Throw in their well-known curve balls of nailing great cover songs (from the likes of Talking Heads, The Beatles, The Velvet Underground, Bob Dylan, Genesis, Pink Floyd and, even more recently, The Rolling Stones and Rage Against The Machine) and these two local shows will be sure to delight.